Has Huge Wave Anomaly From Antarctica To US East Coast Weaponized Hurricane Nate? 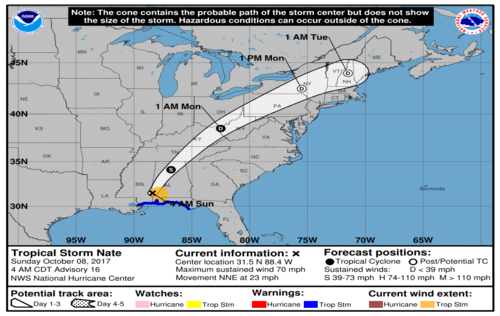 With hurricane Nate now pummeling the Louisiana area and parts of the Gulf Coast and poised to race up parts of the East coast just the latest monster to strike already hurricane-battered America, we take a look within this story at more signs we're witnessing weather modification and weather warfare playing out before our eyes. We also see a brand new video showing a huge 'wave anomaly' on the US Navy's MIMIC website which stretches from Antarctica to the US East coast, interacting with Nate as seen in the image above. We'll also take a look at a new video from videographer MrMMBBB3 about hurricane Nate showing us it has reached stupefying heights with temperatures at the top cloud levels of between NEGATIVE 90 to NEGATIVE 120 degrees fahrenheit while comparing that with this recent story from Dane Wigington over at his Geoengineering Watch website in which he warned us that geoengineering of the weather is creating 'freeze fry extremes' and temperature whiplash scenarios. Is Nate one such example? First, a very interesting comment from someone in the path of Nate living near the Gulf Coast screenshot from the MrMMBBB3 video seen below. While most of the 'legacy' mainstream media will never fully report upon weather warfare or weather modification, still calling such claims 'fake news' or a 'tinfoil hat conspiracy', the ignorance of the public may be short lived as even 'gatekeeper' scientist Michio Kaku recently went on CBS This Morning and proclaimed scientists are firing trillion watt lasers into the sky in attempts to control the weather. 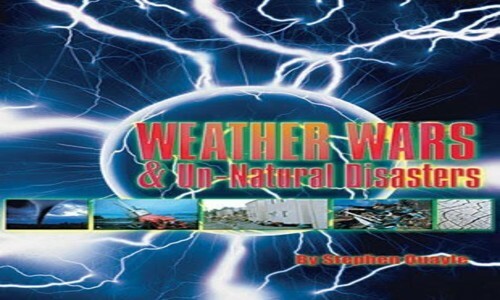 Those paying attention know weather modification has been going on for many, many years with weather modification patents documented going back nearly 100 years. 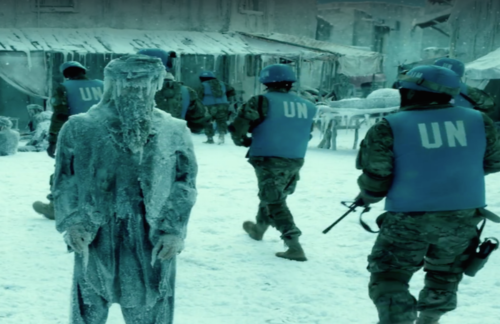 In Hollywood's latest movie 'Geostorm', out of control weather modification is turned into a weapon which begins attacking the Earth as also seen in the extended trailer for the movie in the final video below. Why is Hollywood finally taking on 'weather modification'? Global climate engineering operations are creating ever more extreme weather and temperature whiplash scenarios. The immense scale of climate forcing being carried out by the geoengineers is wreaking havoc on the biosphere. Over 70 years of covert climate intervention and weather warfare (along with countless other forms of anthropogenic activity) has done unimaginable damage to the planet’s life support systems. The blowback is already unfolding and will get rapidly worse. The extreme and unprecedented temperature imbalances already occurring in the US, and forecasted (scheduled) to occur, are beyond alarming. The 15 minute video below exposes some of the most primary agendas of the ongoing climate engineering operations. The climate engineering / weather / biological warfare operations must be brought to light, and to a halt. In a fascinating recent interview with 'the Health Ranger' Mike Adams, Dane Wigington exposed the globalist geoengineering weather control agenda while also revealing weather weaponization may have been the culprit in hurricane Maria recently completely leveling Puerto Rico, knocking out power across the island and sending the island's people back to the dark ages nearly overnight. The first video below takes a look at the bizarre wave anomaly that stretched from Antarctica to the US East coast recently while in the 2nd video below we hear all about hurricane Nate's incredible cloud height and extremely cold temperatures at the upper cloud levels. In the third video below we hear from Dane Wigington about the bizarre weather shifts that geoengineering is causing, wreaking havoc upon the Earth while the 4th video below is Mike Adams recent interview with Wigington prior to the final video below, the latest extended trailer of Geostorm.